The RØDE i-XY is the ultimate recording microphone for iPhone®. With up to 24-bit/96k* recording and on-board high-fidelity A/D conversion for both Lightning and 30-pin iOS devices, your i-XY recordings are rich, smooth and accurate. 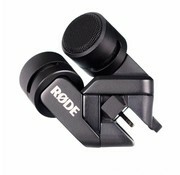 The RØDE i-XY is the ultimate recording microphone for iPhone® and iPad®. With up to 24-bit/96k* recording and on-board high-fidelity A/D conversion, your i-XY recordings are rich, smooth and accurate. At the heart of the i-XY is a matched pair of ½” cardioid condenser capsules, fixed in a perfect 90 degree ‘near-coincident’ alignment. This results in immersive and true-to-life stereo recordings, captured in incredibly high detail. Designed and manufactured in Australia, the i-XY is available in two versions - Lightning and 30-pin. The Lightning version supports the iPhone® 5s, iPhone® 5 and iPhone® 5c. The 30-pin version supports the iPhone® 4S, iPhone® 4, iPad® (3rd generation) and iPad® 2. A foam windshield is supplied for outdoor recording as well as a reinforced protective zip case to ensure your i-XY is available whenever you need it. For more information and to hear audio samples visit www.ixymic.com. i-XY is the perfect microphone for capturing music, from local café gigs, to large stadium shows or even recording your band rehearsal and songwriting sessions. Capture immersive, high-resolution stereo audio with the i-XY mounted atop your camera. i-XY works with any audio app (that accepts a digital stereo input), however the RØDE Rec app provides presets to maximise dialogue intelligibility giving you fantastic results in almost any environment. With the i-XY you'll never have to let a recording opportunity pass by. The i-XY is the perfect recording solution for field reporters, giving you broadcast-quality audio at a moment's notice.